Mix the stock with the half & half over medium heat. Slowly whisk in thetomato powder until there are no lumps. Add the remaining spices and stir well. 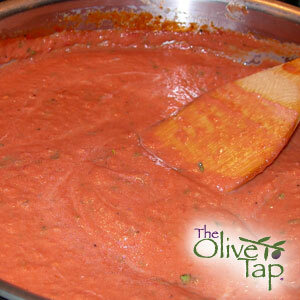 Reduce heat to a low simmer and cook for 30 to 45 minutes until sauce is thickened. Make your pasta while the sauce is thickening. Serve sauce over Penne, Bucatini or your family’s favorite pasta. Top with plenty of freshly grated cheese. Chef’s Note: This was originally going to be a Tomato Basil Soup, but everyone who tasted it thought it would make a great pasta sauce. Thinning it with a bit more stock will produce a nice soup, top each bowl with some freshly cut basil.